The hospital here is the only medical center in Afghanistan that specifically treats victims of burning, a common form of suicide in this region, partly because the tools to do it are so readily available. Through early October, 75 women arrived with burns — most self-inflicted, others only made to look that way. That is up nearly 30 percent from last year. But the numbers say less than the stories of the patients. There are two issues that Ms. Rubin does not raise. One, that self-immolation is sadly becoming so wide-spread that it is taking root in a folk-culture. I was in Herat this past summer, and I got the chance to interview a couple burned victims. The fact that they did not consider any other options– both in terms seeking help or of taking their lives in a less painful way– shows how self-immolation is taking its place in the public psyche as the only option available for these women. You might say: what are the options available for the? The fact that there really aren’t any options confirms self-immolation as the only option. If not countered through public-awareness campaigns, this will become a hauntingly dangerous issue. Another issue that is at the heart of the problem, yet Ms. Rubin does not go in full detail to flesh out, is the economic side. One of the Doctors in Ms. Addario’s video repeatedly says that these issues stem from economic problems, but his language skills limits him to really explain this in detail. The sense that I got over the summer in Herat was that the main economic issue is the large dowries. The value of these dowries are growing exponentially, putting the future groom under tremendous strain. The groom ends up spending years in Iran or Pakistan laboring to meet the dowry demands placed by his in-laws. By the time he marries his bride, he already has a deeply rooted grudge against her. On top of that, having paid so much money for her, he feels like he has bought her and he has the right to treat her in any way he wants. 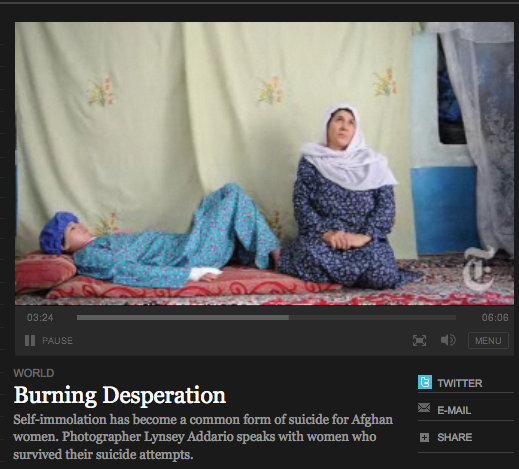 This entry was posted on Tuesday, November 9th, 2010 at 2:59 am	and tagged with Afghan girls, Afghanistan women, Alissa Rubin, buring, Lynsey Addario, Self immolation, The New york Times Afghan women and posted in Media, News and Politics. You can follow any responses to this entry through the RSS 2.0 feed.